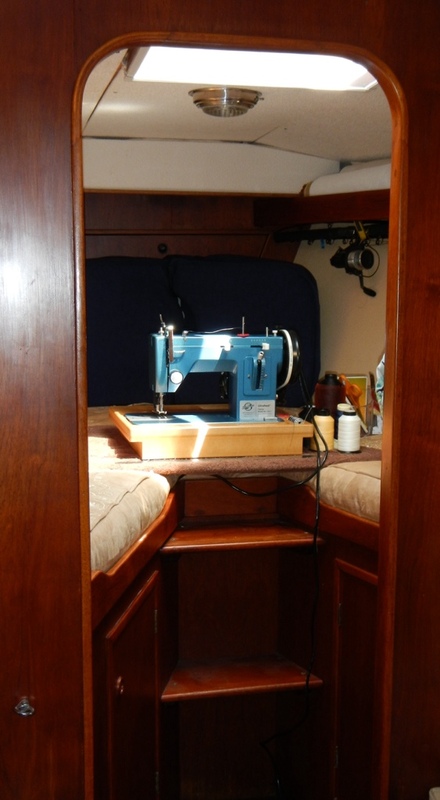 Ok, it’s really just the V-berth, but every space on a boat is multi purpose. Anyway, the LSZ1, I knew it was a tough little machine but still had serious reservations about just how much it could handle. I was coming from a serious commercial Juki LU-563 powerhouse and didn’t think anything could compete with the power of it. Guess what, the Sailrite machine has earned my respect! I haven’t found anything yet that has given it any pause. And I have shoved some tough stuff at it. The sail covers frequently had 6 layers of Sunbrella and 4 layers of sailcloth going through at one time, more at seams. Didn’t hesitate. Not one skipped stitch either. Impressive. The shade awning had some real thick layers at the reinforcement points too, no problem. The toughest challenge I threw at it was the cushions. Sunbrella usually is about 7-9 oz per yard weight. Storm sail cloth is about 9 oz. per yard weight. The Crypton upholstery fabric I chose was 16.9 oz per yard weight and with welting and seams I frequently had 8 layers cranking through it. That little machine didn’t care at all. Wow. Oh, and by the way–the cushions are done!!! I love them. We went old school, with welting and buttons. 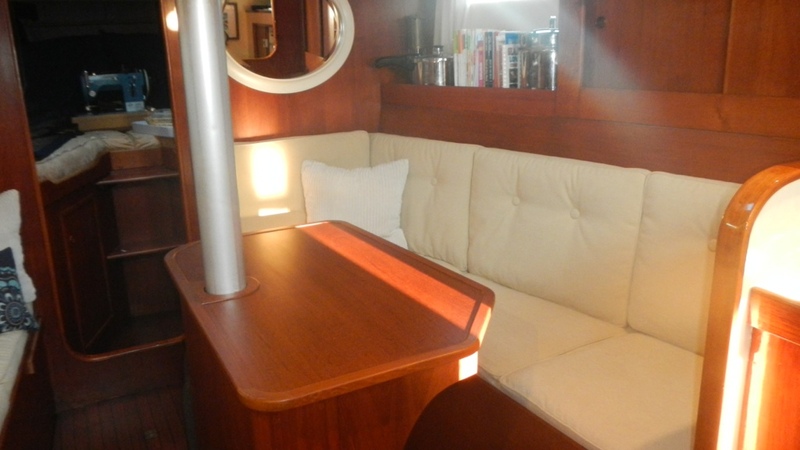 I think it matches the traditional interior of the boat. Well, I’m not completely done, I am dying to make fun new throw pillows to brighten them up. Like frosting on a sugar cookie. Ah, but that will wait as it isn’t really a priority. I am packing fabric and it will be a fun rainy day project once we get cruising. Until then, my plain white pillows will do-I have a mizzen sail to repair instead. So where is the rest of my crafting and sewing stuff? 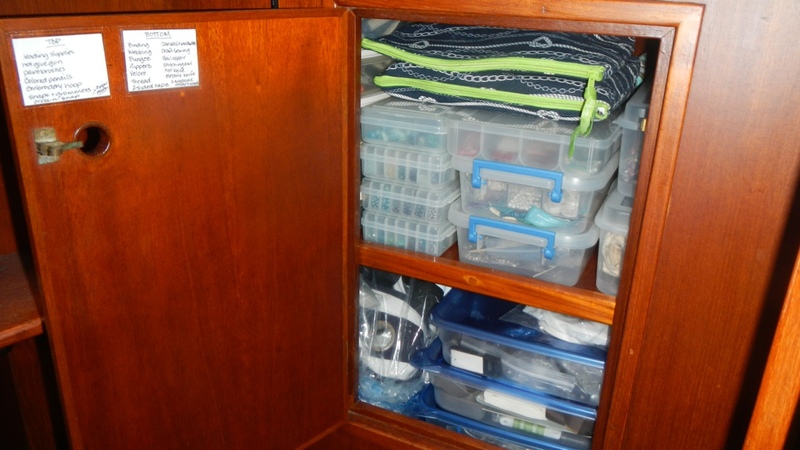 Everything but the fabric is in one very tightly packed locker. There is most definitely a one-in-one-out rule going on in there as it is filled to the brim with my canvas and crafting supplies. The bolt fabric is on a long shelf above the fishing poles and my folded fabric is in a waterproof bag. I am all set to keep on sewing. Of course I have a happy helper to assist. Kai is ever eager to press the foot peddle, ready or not. Thanks! I do need to make Kai a bed, but he is in the phase that EATING the beds are much more preferable to SLEEPING in the beds, so I’m still dragging my feet on that project. Boys! Thanks. 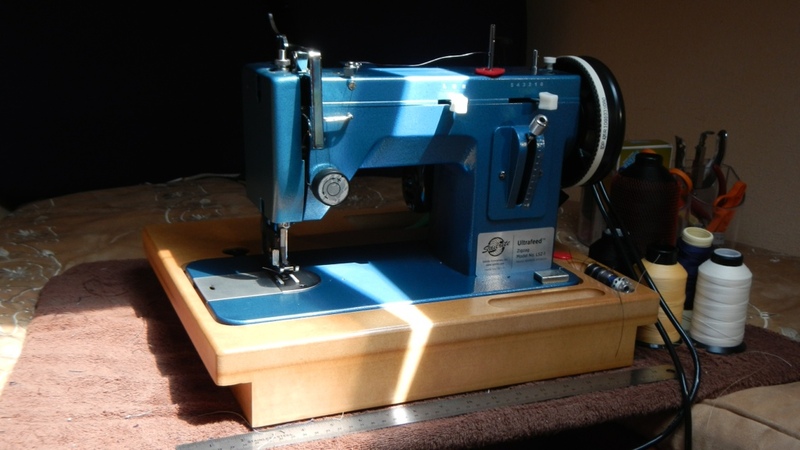 Saw you got a new sailrite too….what is on your project list? Wow! beautiful cushions. You did a great job. Such an awesome use of the v-berth! If ours wasn’t already our garage i would totally take it over 😉 I love my Sailrite! Ha ha, I totally get the garage! I’m not sure where I am going to keep the machine when not in project mode. Probably just sitting on the bunk. Just another detail to figure out. 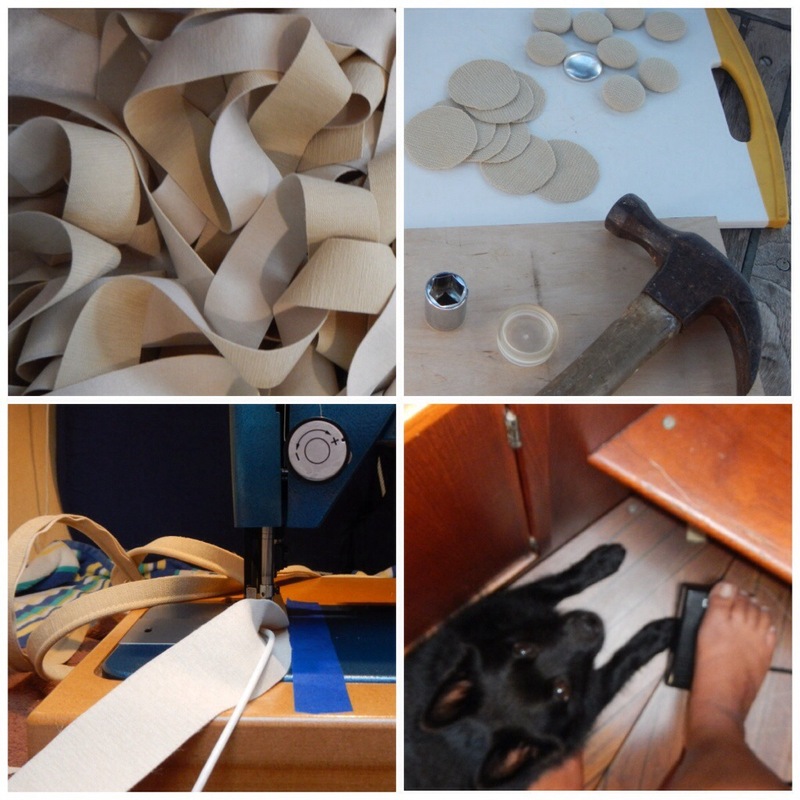 You have done some amazing projects with your sailrite! Looks really good! Did you end up using the Crypton? Yep, I went with the Crypton and so far love it. Kai already proved it truly is “blueberry proof” when he ate a blueberry muffin on it the other morning!